Last week, I spent two full days doing research in the Garry Winogrand archives at the Center for Creative Photography in Tucson, Arizona. I went there for a few reasons, but mainly because I was interested in their holdings of Winogrand’s contact sheets. CCP has all 19,000 of them. I spent five hours a day with a loupe, trying to take a critical look at what Winogrand saw and chose to photograph over thirty years. Big task, not enough time. Specifically, I looked at a slice of the nearly twenty-five hundred sheets that were printed posthumously — work that was done mostly in Los Angeles, shot from the passenger side of a moving car. No one’s really waded in and made sense of the posthumous images yet, and I wanted to see what they looked like, how messy they might be. There’s something about the “story” of what happened in the last years of Winogrand’s life that’s intriguing. How a photographer, knowing that he’s running out of time, would increase the pace, and leave thousands of undeveloped rolls to be developed after his passing. What I found was as fascinating as it was just plain mad, and in accumulation, the pictures temporarily blew out my ability to make sense of anything visual. (Eyes = blood shot) I don’t know how magazine editors did it in the old days, hunched over a light box with an eye closed; it takes stamina. 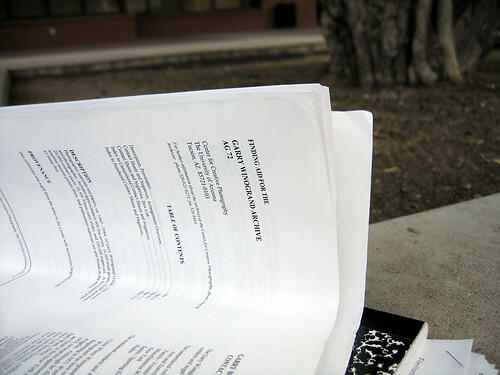 There are books-worth of unpublished material in the archive that rival the work that’s already been published. At the archive, you’re asked to clear your pockets, surrender your pens and leave all your belongings in lockers. You can’t touch anything without wearing cotton gloves. The staff there does a great job and watches you constantly. For good reason. Against better judgement, I knew I needed a rough sketch of what I was up to there, so I snuck this blurry snapshot, showing a sheet from 1971 antiwar demonstrations in Central Park. 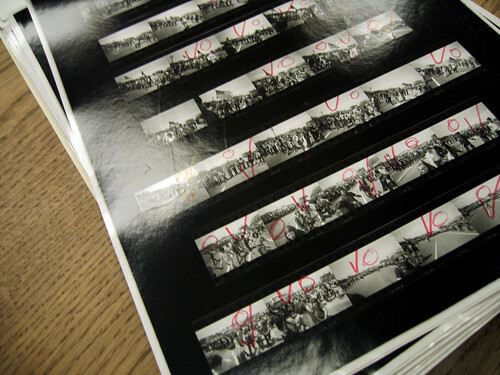 The red checks and 0’s determine which frames Winogrand requested for work prints. This particular sheet of about 40 images is from a folder of a hundred images (4000 images in each folder). Each box in the archive held three folders (12,000 images per box) and there are 56 boxes in total (which equals 72,000 to 760,000 images on contact sheets, depending on your math, and images per sheet). Thanks for the description of the Winogrand archives at in Tucson. I always wondered if this place was accessible to the public and just how many negatives it held. What’s the procedure for visiting the archive? Do you need an appointment? Are you allowed to photograph or make copies of anything? In 2002, I took a street photography class with Richard Gordon at Berkeley Extension in San Francisco. One of the highlights was a slideshow of Winogrand’s rejects. There were tons of pictures that were obviously a few frames apart from some of his famous ones. An amazing way to see how he thought, how he approached a subject and what things he tried. I can only begin to imagine how great having access to those files would be. I have to check it out next time I have a chance to go to Arizona. one of the highlights of the big Winogrand show at SFMOMA (this was in ’89 or ’90, at the old building on Van Ness) were all the contact sheets, blown up a la William Klein style, showing circle marks and x’s like what you show above. (which reminds me, have you seen any of those “Contacts” dvd’s? I have 2 of them coming from Amazon). I once did something similar as you did, with the Hiroshige archives at the Honolulu Academy of Art once….but then, I had to write some letter explaining my “project”….does the CCP require anything from you to be able to see this stuff? And no pens….how do folks researching for a book (or for a blog even!) deal with that? At any rate, I think i’m not the only one who feels quite envious you had this opportunity. Here are links to those dvds. I haven’t seen them (1, 2) but they look interesting. The archive is open to the public, but you’ll need an appointment. It’s in Tuscon; if it were in NYC, it’d be swamped. I didn’t need a letter. They supply pencils. There’s a third “Contacts” dvd, too. — and they are extremely aware of that situation. They floated a proposal for a huge web archive and the complete digitization of their collections a year or so ago but did not, alas, win the grant. Even so, they’ll be implementing a new archives/collections management/library system that has a very good web interface, within the next few years. I’ve always wondered what Winogrand would think of digital. I can’t imagine that he wouldn’t have embraced it. Winogrand had one decidely NON-digital aspect to his way of working — he didn’t look at what he shot right away, but piled up the rolls in storage for processing later. That way he could give himself some distance from the pictures and look at them as pictures, not records of his recent experiences. Just love ur point of view on Winogrand’s unpublished (yet) archieve and truly admire ur endurance of spending so many hours watching images which many of us may never have the chance to see. Waiting patiently on a second article. What a great look into his work. Thanks for giving us a peek. Just a note to say that, while I helped edit Garry’s posthumous work for the MoMA retrospective, outside of a period of about a week–when I proofed some European pictures, I did not print for him. His printer was Tom Consilvio, who worked w/Garry during his last years in LA. Tom was faster than any printer I’ve ever seen–and deeply understood the kind of print Garry wanted. Updating this entry based on Tod’s comment. I went to look up Tom Consilvio on the web a number of months ago to see if maybe he’s done some photography to find out that he commited suicide some years ago? Does anyone have details on this? Would love to understand what happened.